As a professed Lush Cosmetics addict, I am always searching for fun and easy dupes of my favorite Lush products. As beautifully scented and amazing as their products are, sometimes I just love to see if I can make the products myself. During the Winter months a great lip scrub recipe is perfect for treating those dry, cracked lips that are in desperate need of some TLC. Lip scrubs help remove excess dead skin cells to reveal the healthy skin beneath. 1. In a small bowl, mix together the granulated sugar and olive oil. 2. Add a small drop of peppermint extract and mix into the sugar and olive oil. 3. Optional: Add 1-2 drops of food coloring of choice into the mixture. 4. Add mixture to your small lip balm container! 1. Using clean hands use your index finger to scoop out some of the scrub. 2. Apply scrub to clean, dry lips using slow and soft circular motions for approximately one minute. 3. Using a warm wet washcloth gently wipe away the scrub from your lips. 4. Apply a lip balm or moisturizer to lock in hydration! If you choose to color your lip scrub, make sure to choose a light pink or "natural" shade, as it may stain your lips. Go to the Dollar Store for your lip balm container. They have small plastic or acrylic containers, as well as cute tiny mason jars you can use. Choose a different "extract" to make different flavors. Try almond, vanilla, or chocolate! Interested in MORE Lush product dupes? 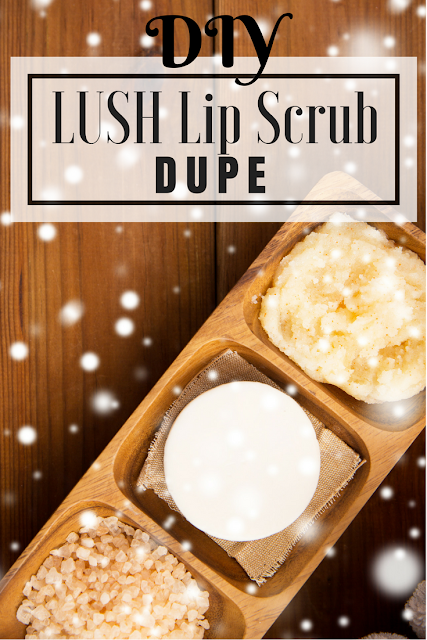 Check out my post for How To Dupe Lush Coalface! Also, follow me on YouTube for more DIY beauty!